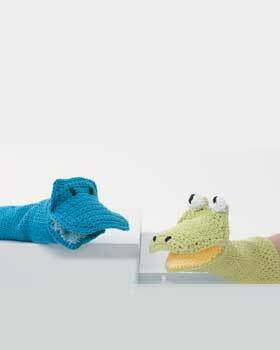 Make bath time a blast with these bath puppet crochet patterns from Lily Sugar n' Cream. Create a frog or whale for any child to play with in the bath. FROG: 1 ball each of: Green (MC); Yellow (A); White (B); small amount of Black (C) for embroidery. WHALE: 1 ball each of: Dk Blue (MC); Lt Blue (A); Black (B) small amount of Black (C) for embroidery. Small amount of stuffing for Frog’s eyes. **Body: With MC, ch 36. Join in rnd. 1st rnd: Ch 1. 1 sc in same sp as last sl st. 1 sc in each ch around. Join with sl st in first sc. 36 sc. 2nd rnd: Ch 1. 1 sc in each sc around. Join with sl st in first sc. Rep last rnd until work from beg measures 7 ins [18 cm]. Back of Head: Next row: Ch 1. 1 sc in each of next 18 sc. Turn. Leave rem sts unworked. Next row: Ch 1. Draw up a loop in each of next 2 sc. Yoh and draw through all 3 loops on hook - Sc2tog made. 1 sc in each sc to last 2 sc. Sc2tog over last 2 sc. Turn. Next row: (RS). Ch 1. Sc2tog over first 2 sts. Sc2tog over next 2 sc. Turn. Leave rem 4 sts unworked. Next row: Ch 1. Sc2tog over next 2 sts. Fasten off. With RS of work facing, join MC with sl st to rem 4 sts. Ch 1. Sc2tog over first 2 sc. Sc2tog over next 2 sts. Turn. 1st row: Ch 1. Sc2tog over first 2 sc. 1 sc in each of next 14 sc. Sc2tog over last 2 sc. Turn. 2nd row: Ch 1. 1 sc in each st to end of row. Turn. 3rd row: Ch 1. Sc2tog over first 2 sts. 1 sc in each sc to last 2 sts. Sc2tog over last 2 sts. Turn. Rep last 2 rows twice more, omitting turning ch at end of last row. 10 sts. Front of Head:With MC, ch 13. 1st row: (RS). 1 sc in 2nd ch from hook. 1 sc in each ch to end of ch. Turn. 12 sc. 2nd row: Ch 1. 2 sc in first sc. 1 sc in each sc to last sc. 2 sc in last sc. Turn. Rep last row twice more. 18 sc. Next 8 rows: Ch 1. 1 sc in each sc to end of row. Turn. Next row: (RS). Ch 1. Sc2tog over first 2 sc. 1 sc in each sc to last 2 sc. Sc2tog over last 2 sc. Turn. Rep last row 4 times more. 8 sts. Next row: (RS). Ch 1. Sc2tog over first 2 sts. Sc2tog over next 2 sts. Turn. Leave rem 4 sts unworked. 2nd row: Ch 1. 2 sc in first sc. 1 sc in each sc to last sc. 2 sc in last sc. Turn. Rep last row twice more. 18 sc. Next row: (RS). Ch 1. Sc2tog over first 2 sc. 1 sc in each of next 14 sc. Sc2tog over last 2 sc. Turn. Next row: Ch 1. 1 sc in each st to end of row. Turn. Next row: Ch 1. Sc2tog over first 2 sts. 1 sc in each sc to last 2 sts. Sc2tog over last 2 sts. Turn. Rep last 2 rows twice more, omitting turning ch at end of last row. 10 sts. Fasten off. With WS facing each other, pin Back of Head and Front of Head matching eye shapes tog. Join MC with sl st at beg of joining row. Ch 1. 1 sc in same sp as last sl st. Working through both thicknesses, 1 sc in each sp around to opposite side of joining row, working 3 sc at tops of eyes. Fasten off. With WS facing each other, pin Mouth, Front of Head and Chin Extension tog. Join MC with sl st at any point of joining row. Ch 1. 1 sc in same sp as last sl st. Working through both thicknesses, 1 sc in each sp around joining row. Sl st in first sc. Fasten off. Eyes: (Make 2). With B, ch 2. 1st rnd: 10 sc in 2nd ch from hook. 2nd rnd: Ch 1. 1 sc in each sc around. Join with sl st in first sc. Fasten off. Sew on eyes as illustrated, placing stuffing inside, as you sew. With C, embroider eyes and nostrils. Work from ** to ** as given for Frog. 2nd and 3rd rows: Ch 1. 1 sc in each st to end of row. Turn. 4th row: Ch 1. Sc2tog over first 2 sts. 1 sc in each sc to last 2 sts. Sc2tog over last 2 sts. Turn. Rep last 3 rows once more, then 2nd and 3rd rows once, omitting turning ch at end of last row. 12 sts. Fasten off. 2nd row: 2 sc in first sc. 1 sc in each sc to last sc. 2 sc in last sc. Ch 1. Turn. Next 8 rows: 1 sc in each sc to end of row. Ch 1. Turn. Next 5 rows: Sc2tog over first 2 sc. 1 sc in each sc to last 2 sc. Sc2tog over last 2 sc. Ch 1. Turn. 8 sts. Omit turning ch at end of last row. Fasten off. Mouth: With A, ch 13. 1st row: (RS). 1 sc in 2nd ch from hook. 1 sc in each ch to end of ch. Ch 1. Turn. 12 sc. Next row: Sc2tog over first 2 sc. 1 sc in each of next 14 sc. Sc2tog over last 2 sc. Ch 1. Turn. Next 2 rows: 1 sc in each st to end of row. Ch 1. Turn. Next row: Sc2tog over first 2 sts. 1 sc in each sc to last 2 sts. Sc2tog over last 2 sts. Ch 1. Turn. Rep last 3 rows once more. 12 sts. Next 2 rows: 1 sc in each st to end of row. Ch 1. Turn, omitting turning ch at end of last row. Fasten off. With WS facing each other, pin Back of Head and Front head matching top of head. Join MC with sl st at beg of joining row. Ch 1. 1 sc in same sp as last sl st. Working through both thicknesses, 1 sc in each sp along joining row. Fasten off. With WS facing each other, pin Mouth, Front of Head and Chin Extension tog. Join MC with sl st at any point of joining row. Ch 1. 1 sc in same sp as last sl st. Working through both thicknesses, 1 sc in each sp around to opposite side of joining row. Sl st in first sc. Fasten off. With B, embroider eyes as shown in picture.